Sylvia “Ronie” Wronski pitched for her hometown Milwaukee Chicks, a team that was a tremendous success on the diamond but a disappointment at the gate. The Chicks won the 1944 All-American Girls Professional Ball League (AAGPBL—now recognized as the All-American Girls Professional Baseball League) championship in Milwaukee’s only year in the league with Wronski serving as the solid No. 4 starter on the team. The right-hander not only contributed to the Chicks’ title run but also pitched in many significant games throughout the season. Born in Milwaukee on December 2, 1924, Wronski grew up as one of seven children at 2867 North Hubbard Street in the Riverwest, Milwaukee’s north-side neighborhood. Her father, John, worked as a machinist, while her mother, Anna, was a busy stay-at-home mom. Wronski attended grade school at St. Casimir and high school at Milwaukee Riverside. She learned to play ball with her three older brothers and in city playground programs before going on to play in local softball leagues. On April 29 and 30, 1944, Wronski tried out for the AAGPBL at Borchert Field at North Eighth and West Chambers Streets, the home of the Chicks and the American Association Brewers. 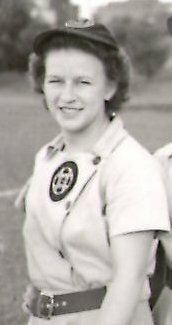 The right-hander impressed as she was one of only five ballplayers, out of 68, to be offered contracts and sent to Peru, Illinois, for AAGPBL training camp. Considered a “promising rookie” by the Milwaukee Journal, Wronski was “farmed out” to the strong suburban Milwaukee leagues, placed in West Allis for “further seasoning.” Wronski was later called up to the Chicks and, on June 30, 1944, made her AAGPBL debut, pitching a scoreless final inning at Borchert Field in an 8–2, nine-inning loss to the Racine Belles. She had joined then-injured third baseman Vivian Sheriffs Anderson as one of only two Milwaukee natives to ever play for their hometown Chicks. Wronski was not the Chicks’ mound ace, as future Hall of Fame manager Max Carey had stars Connie “Iron Woman” Wisniewski, Jo Kabick, and Viola “Tommy” Thompson in a formidable underhand fast-pitch rotation that led his team to a 70-45 record. However, the 5-foot-2¼, 142-pounder did fashion a sound 1944 record of 4-2 with a 3.06 ERA over 13 games (four complete) and 53 innings pitched using a softball. Notably, Wronski did achieve something done by no other Milwaukee pitcher. She came within one out of a no-hitter on July 9, settling for a quick one-hour, five-minute one-hitter after Racine Belle Edie Perlick hit a two-out seventh-inning single. Wronski was the 4–1 (Racine’s lone run came on two errors and a sacrifice fly) victor and scored her only run of the year in this shortened first game of a doubleheader. The very next day, the durable Wronski threw a nine-inning complete-game seven-hitter, and beat the Belles again, 8–2, even though she had a tough day in the field, committing three errors. Eight days later, the hurler traveled to Chicago, where she was the Chicks’ starting pitcher in front of 16,000 fans at Wrigley Field. The exhibition game, played as a free event for service personnel, Red Cross volunteers, and blood donors, was no pitchers’ duel, but Wronski recalled it as especially memorable. Milwaukee beat up on the South Bend Blue Sox, 20–11, in a game played with portable lights, long before Wrigley Field possessed permanent lights. The Chicks, often called the Schnitts (German slang for small beers, hence “little Brewers”), typically drew only 200 to 300 fans at Borchert Field. Several reasons led to this low attendance. First, the Chicks competed with the American Association pennant-winning Brewers (owned by Bill Veeck and managed by Charlie Grimm and Casey Stengel), who often played before capacity crowds of 13,500. The Brewers retained the prime home dates and played as many night games as possible, leaving the women with a less desirable daytime schedule. Second, local press coverage was minimal, and Milwaukee fans, many of whom considered the Chicks’ 95-cent grandstand ticket price too high, never embraced the team as did their counterparts in smaller AAGPBL cities with lower-priced admission such as Kenosha and Racine. Finally, the absence of local ownership (chewing gum mogul Philip Wrigley owned 100 percent of the Chicks, unlike his shared ownership with local proprietors in the other cities) meant that no one in Milwaukee had a vested interest in promoting the Chicks and making them an integral component of the community. On Sunday, September 3, 1944, Wronski had the distinction of pitching in the Chicks’ last Borchert Field home game. The Milwaukee native threw a nine-inning, complete-game six-hitter for a 4–2 win over the Kenosha Comets. In the AAGPBL championship series against the Comets, Carey never used Wronski or Clara Cook, who was the fifth pitcher acquired from Kenosha during the regular season. Instead, he chose to primarily pitch Wisniewski and Kabick to secure the league title. The 5-foot-8 Wisniewski won all four games of the championship series with 46 innings pitched and finished tied for second in the AAGPBL regular season with 23 victories and nine shutouts. Kabick, the 5-foot-7½-inch league leader with 26 wins and 43 games started, and the left-handed Thompson pitched the balance of the innings. As the Kenosha Evening News put it, “Viola Thompson, Sylvia Wronski, and Clara Cook are fortifications on the Chick staff.” Remarkably, the Chicks won the series even though all seven games were played in Kenosha because the Brewers had occupied Borchert Field for their American Association playoffs. Wronski’s pro career ended almost as abruptly as the team’s stay in Milwaukee. Because of their low attendance figures, the Chicks lost money and moved to Grand Rapids, Michigan, in 1945. Wronski played in only four games in 1945 before being released during the season. Wisniewski, Kabick, and Thompson pitched most of the Chicks innings under new manager Benny Meyer, leaving little work for Wronski. “Then I had a chance in 1946 to play for a Chicago semipro team,” she remembered, “but my fiancé (Ed Straka) said if I played in Chicago, he would go to school in Connecticut.” She retired from professional ball, and he did not head east. Her career statistics included four wins and two losses in 17 games pitched. The right-handed hitting Wronski batted only 22 times with one hit. After getting married at St. Casimir in 1947, Wronski took on the last name of Straka and had two daughters and one son. Ed died of lung cancer at the age of 29, only months after suffering serious injuries in a car accident. This left Sylvia to raise her three children alone. As a single mother in the 1950s she became a waitress and bowling alley cleaner in order to be home when her children were. Wronski later worked as a factory machine operator (eight years at Cutler Hammer and 21 years at Briggs and Stratton), often juggling three jobs at once. Eventually, she became a proud grandmother of six and great-grandmother of five. Like so many AAGPBL ball players, Wronski stayed physically fit later in life. She bowled in two leagues, walked daily, and participated in water aerobics. In addition, she visited local Little League games and played catch with young ballplayers thrilled to learn from a Milwaukee Chick. Wronski never left her hometown and continued to own her own home until her death in 1997. According to her daughter, Christine Wiemann, Wronski shared thoughts about her time in the league only when asked. She was a quiet woman by nature but did have opinions about many aspects of her AAGPBL years, including her manager, former Pittsburgh Pirate and Brooklyn Dodger, Max Carey. When asked about the 1992 movie A League of Their Own, Wronski declared, “No coach ever, ever walked into the ladies’ locker room. And the press never came into the locker room, either. The players were interviewed outside. “The other thing I disliked was the portrayal of the manager. I have no clue who Tom Hanks was supposed to be like, but it sure wasn’t Carey. Max was nothing but a gentleman at all times. He was square,” affirmed Wronski, using a 1940s term for a good person. Wronski was also not keen on the AAGPBL charm school and the short dresses the ballplayers wore for their uniforms. The Chicks wore one-piece gray dresses with red trim and belts. Knee-length black socks and spikes were standard issue and each Chick wore a small black cap with a large red bill and a black M inside a yellow circle. As Christine stated, “My mother wore a dress for church, weddings, and funerals. She wore blue jeans the rest of the time. She said the lessons didn’t stick.” Wronski was impressed with the food and travel afforded her as a professional ballplayer. Growing up in a large household with a modest income, she never had steak other than Salisbury. As Wronski explained, “The first time I ordered steak, I didn’t know what I was eating.” She also loved to ride the train to AAGPBL cities. Wronski was proud that she played on Milwaukee’s first professional world championship team. As Max Carey proclaimed in recognizing the 1944 champions of the All-American Girls Professional Ball League, “Right here in this room is the greatest girls’ ball club in the world.” Sylvia Wronski was an integral part of that team. “1944 Milwaukee Chicks.” All-American Girls Professional Baseball League. All-American Girls Professional Baseball League Players Association, Inc., 2005. August 22, 2009. <http://www.aagpbl.org/teams.cfm?ID=7>. AAGPBL Baseball Card, #226–Sylvia Wronski, Larry Fritsch Cards, Stevens Point, Wisconsin. Cole, Jeff. “Straka, then Wronski Pitched in Women's League.” Milwaukee Journal Sentinel, December 1, 1997, p. 6B. Fidler, Merrie A. Origins and History of the All-American Girls Professional Baseball League. Jefferson, North Carolina: McFarland & Co., 2005. Keenan, Marie. “All-American Girls Professional Ball League.” Major League Baseball: Facts, Figures and Official Rules. Racine, Wisconsin: Whitman, 1945, pp. Kenosha Evening News, September 5 and 8, 1944. Milwaukee Journal, May 1 and 7, July 1 and 10, August 31, and September 4, 1944. Milwaukee Sentinel, July 1 and 10, and September 4, 1944. Morgan, Thomas, and James Nitz. “Our Forgotten World Champions: The 1944 Milwaukee Chicks.” Milwaukee History: The Magazine of the Milwaukee County Historical Society, Summer 1995, pp. 30-45. Morgan, Tom, and Jim Nitz. “A Team of Their Own.” Milwaukee Magazine, July 1994, pp. 10-11. Morgan, Tom, and Jim Nitz. “When the Chicks Were Champs, but Not Many Fans Cared.” Milwaukee Journal, July 31, 1994, p. 3. “Oral History Interview of Sylvia Wronski Straka.” Interview by Lisa Hutchinson. University of Wisconsin-Milwaukee Graduate Public History Class Project: The Forgotten Champs-The Milwaukee Chicks of 1944. March 20, 1995. Racine Journal Times, July 1, 10, and 11, September 5, 1944, and July 13, 1945. Straka, Sylvia obituary. Milwaukee Journal Sentinel, November 30, 1997, p. 7B. Straka, Sylvia G. “Information Sheet for Archives.” Letter to the Northern Indiana Historical Society. 1991. Wiemann, Christine. Telephone interview. August 30, 2009, and January 3, 2010. Wronski, Marie. Telephone interview. January 3, 2010. Wronski Straka, Sylvia. Personal interviews. May 25, 1994, April 18, 1996, and November 3, 1997.